Megan is 17 years old. She graduated from the Illinois Math and Science Academy this past spring, and she will be attending Carnegie Mellon University this fall. Her favorite subjects are mathematics and computer science. In high school, Megan was an active member of the math team, math circle, Science Bowl, quizbowl, the computer science club, and the karate club. In her spare time, she enjoys listening to music, browsing the internet, and playing logic and puzzle games. A demonstration illustrating the mathematics behind the Rubik's Cube, as well as its bigger and smaller cousins. Use the sliders to control the opacity and dimension of the cube, which can range anywhere from a 2x2x2 cube to a 12x12x12 cube. You can also change the colors of specific faces by using the color controller. 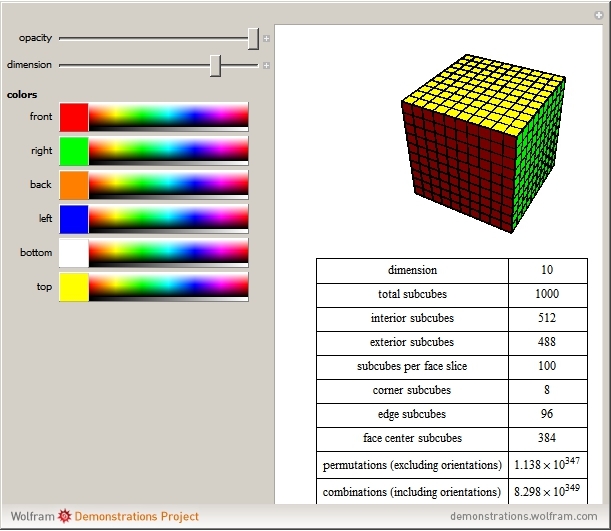 As you change the dimension, have fun observing what happens to the number of cubies exhibiting certain properties and relative locations within the cube, as well as the number of permutations and combinations of positions the cube can take.